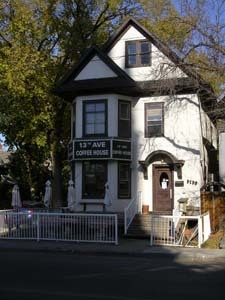 Again, no picture of the food, but a picture of the outside of 13th Ave Coffee in Regina. Sorry. Tasty food, and a cool, eclectic decor, but the service was odd. Especially for a customer service guy like me. I couldn’t tell if I should sit and wait for someone to come to me, and then if I needed to pay right away, whether I should get my own cutlery, whether I needed to sit somewhere specific. And there appeared to be no staff in sight. It was all very puzzling. The menu was a series of chalkboards on the wall and I wasn’t entirely sure to what I should be looking to find breakfast-type items. When I found the breakfast bowls that had been recommended, it seemed as though that was the only breakfast item available, but I couldn’t be completely sure. Yes, I could have asked, but that is not something I’m wont to do. To add to its amateurish feel, the website is awful and hasn’t been updated in quite a while. The “coming soon” announcement is for something that’s been available for almost six months. The Menu section is well-organized, but there’s a “Food photo coming soon” placeholder image on the majority of items, which were posted more than 18 months ago. The Blog has three entries posted over 12 months and not more recently than six months ago. It would also be nice if it included some explanation of the protocol for ordering and sitting. As I mentioned, the food was tasty and the decor was cool and eclectic, so I would definitely recommend it, with the caveat that it is no more than it appears: the menu’s on the wall, order and pay at the weird cubbyhole window, then sit wherever there’s room. Enjoy! This entry was posted in Opinion and tagged breakfast, eclectic, food, review.